Deemed as the largest social network for professionals and colleagues, LinkedIn is entirely a beast of its own. Unlike Facebook, Instagram or Twitter, LinkedIn manages your professional social connections and content to like-minded individuals. By following simple LinkedIn best practices, you can use this social network to your business’s advantage. This space is ideal for those wanting to cultivate audiences, build communities and push content that directly correlates to those in your industry. We’re not saying you can’t do these things on other social networks. But we are going to tell you this is the best place for businesses to build their professional community. Jump to the LinkedIn Best Practices Infographic. With more than 3 million company pages on LinkedIn, it’s smart to use this channel to showcase your products or services and increase business development. Using this channel in the best way will help you build customer advocates, reach new audiences and engage with users on professional interests. 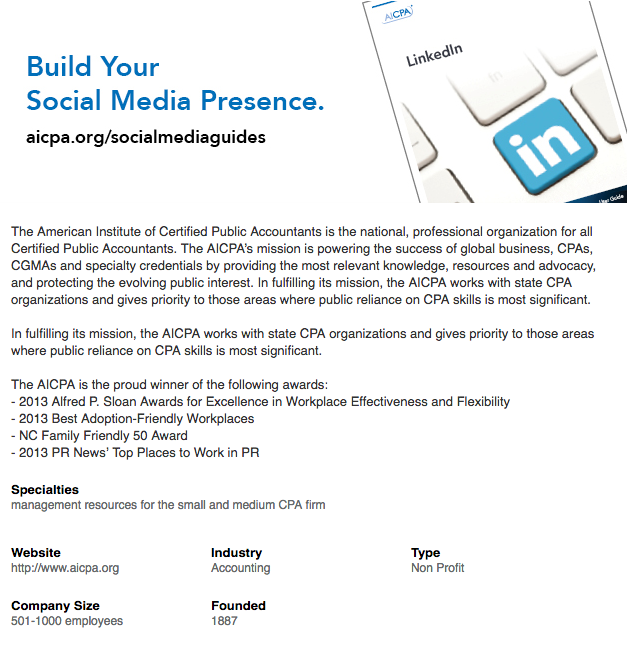 In a case study by LinkedIn with the American Institute of Certified Public Accountants (AICPA), the social network helped increase the association’s group membership by 40% through community-building and engagement. LinkedIn was the top source of traffic to AICPA’s website, which shows the value of building a professional community and maintaining engagement. One of the best reasons for your business to focus on LinkedIn is for publishing content. Social media content is all about who you want to reach and if it will drive viewers down your marketing funnel. For content on LinkedIn, there are many caveats to learn before publishing. Content has to be engaging, enticing and make you want to read the next paragraph to be successful. In the world of digital marketing, it’s all about the clicks. Your content should drive readers to click onward with the right bells and whistles. One way to get readers involved is to add visual content. According to a Bluestone360 infographic, LinkedIn users are 11 times more likely to read or click your article when you include a photo. With stats like this backing up visuals on the network, there’s no reason to only have plain text on your content. Secondly, it’s important to have the right call to action on your content. If you don’t ask your audience to “click to find out more” or “start a free trial,” you’re going to see little movement. Use call-to-action phrases that convert. Out of all the LinkedIn best practices, possibly the most important is producing content that is audience specific. What this means is you have to develop LinkedIn content that people in your industry actually want to read. Who reads our content? : Finding your reader base is critical. Know who is clicking on your LinkedIn page and direct content to those who want it. Who follows us on LinkedIn? : Look at your followers and understand your core demographics on LinkedIn. Who can we target? : Find out who you can target with your content and work with LinkedIn’s campaign features to further your reach. 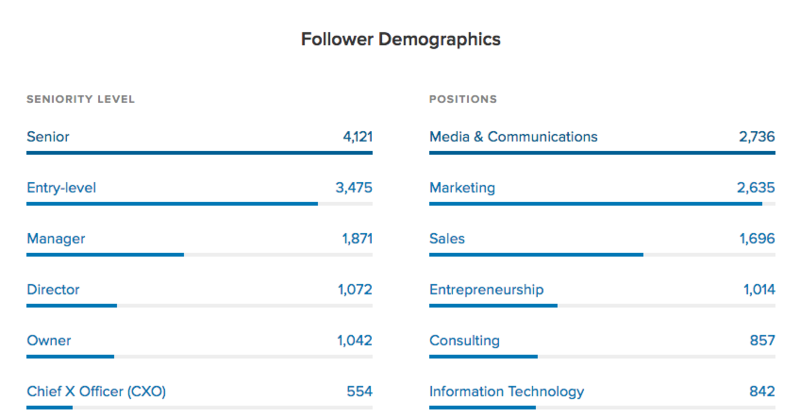 Also, Sprout Social’s LinkedIn Follower Demographics can detail exactly who’s reading your content. Social media content that asks questions, gives insights and discusses topics within your industry will pique readers’ interests. Once you know who’s your audience and ways to get them to click your content, you have to keep them reading. Try publishing content on LinkedIn that asks hard questions that revolve around your industry. Show your readers your “awareness” of the field and don’t be shy. Be willing to give insights into your industry or maybe try showing readers a little “behind the curtain” content. Getting readers to continue on with your content is critical. We are talking about the largest professional social network, right? So write content about upcoming industry events or recap gatherings to keep certain conversations going. LinkedIn has group channels you can join or create around a specific event. There you can engage, discuss or provide information about your company’s whereabouts during the event. If your industry is light on events to cover, feel free to use LinkedIn to support causes. 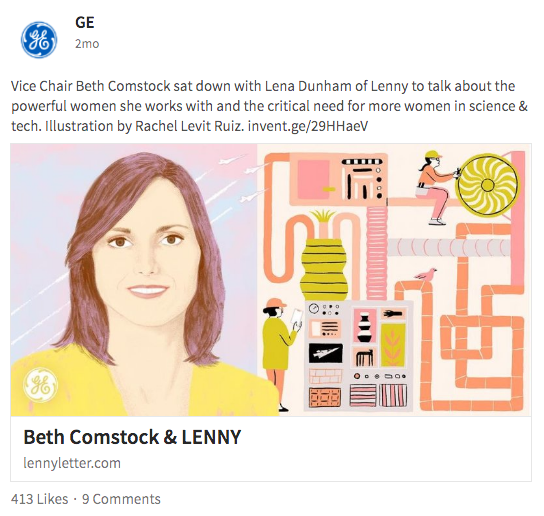 If your company prides itself on certain matters or causes, LinkedIn is a fantastic way to publish content that promotes your brand and the cause. 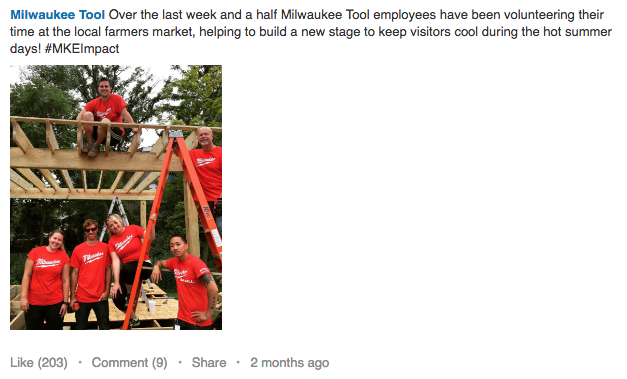 Like we mentioned above, visuals help drive engagement on LinkedIn. This means your header image should be attractive and not just a typical stock photo of businessmen and women smiling. Use unique free stock photo sites Unsplash or All The Free Stock. Just make sure you’re not boring your audience and use visuals that are sensible and engaging. If you’re wanting to promote a visual such as an infographic, but lack a design team, there are options. Try using sites like Canva or Piktochart to make your own. You’re not quite being judged like you would on Instagram. This means you should focus on practical and informative instead of creative and unique. LinkedIn is the professional social network, so feel free to post content with a career angle. Give users insights into your business, how your different teams work and what it’s like to work for you. LinkedIn is perfect for work environment stories or to link your content to new job openings. Adding a career angle here can make it easier for your open positions to be found. Your employees are some of your biggest brand ambassadors. 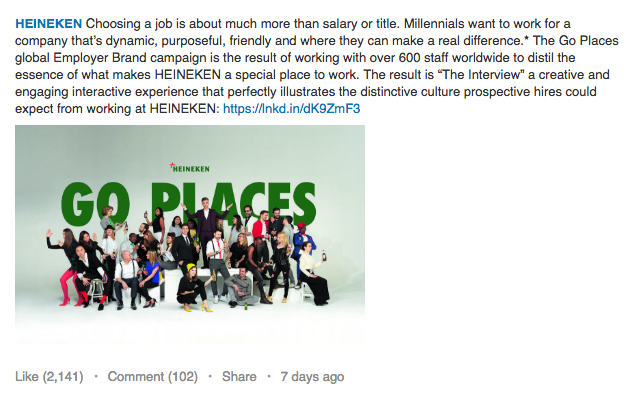 So why not use their social powers to push your brand on a professional network like LinkedIn? However, some employees are a bit nervous to share company content to their own social networks. 21.6% of employees aren’t sure their employers want them to share company-specific content. 15.7% of employees don’t know what content to share. 77.3% don’t feel encouraged to share company-related news on social. 42% of employees feel more successful when they are informed about company news or updates. 3 in 4 employees want to be on top of their company’s business. 40% of users check LinkedIn daily. Above and beyond audience targeting: Through Pulse, you go even deeper into audience demographics and targeting. Pulse lets you reach the people who want to read your content. Get more social shares: Top Pulse posts tend to average 1,843 social shares within a 48-hour period. However, top posts tend to be from users with more followers, but landing there has its benefits. SEO benefits: Pulse provides SEO benefits such as backlinks from LinkedIn and indexable content. Getting your Pulse content to show up in search is highly valuable. Content tagging: Content can be tagged for increased traffic long after publishing. This means your Pulse content will have lasting searchability and benefits, much like a standard blog. Competition is rising: LinkedIn Pulse is only getting more competitive. Now more than ever is a great time to try to be in the Pulse spotlight. Having an outdated or unattended LinkedIn page will always do more harm than good. Just like every other social network, LinkedIn requires you to be present and engaging. Building a community on this platform requires attention and social media monitoring skills. Post Frequently: Post up to once a day and aim for a new post every weekday. Also aim to publish before and after work hours. Engage: Reply, comment, ask questions and join LinkedIn groups regularly. Always Update: Continue to update profile and cover photos, descriptions and business details. Also add new content and users to build your audience. Add Videos: Business Executives were 65% more likely to visit a vendor’s site after viewing a video. Post Career Opportunities: With more than 39 million students and recent grads on LinkedIn, updating career opportunities can drive more traffic to your site. Humanize Your Page: Users don’t want to follow a completely stiff company. Be genuine with your interactions and show there’s a human behind the LinkedIn messages and posts. Visitor Demographics: Discover who reads your content, their industry, job title, seniority level, location, company size, employee vs non-employee, function and referral source. Page Views: The number of company page views during a specified date range. Unique Visitors: The number of users that viewed your company page, excluding multiple visits from a single user. Impressions: The number of times the post was shown to LinkedIn members. Engagements: The number of interactions divided by impressions. Clicks: The number of clicks on your content, company name, or logo. Followers Acquired: The number of new followers you gained from a sponsored update (non-organic on native platform, but available through Sprout Social). Audience: Shows if a post was sent to all your followers or a targeted group. 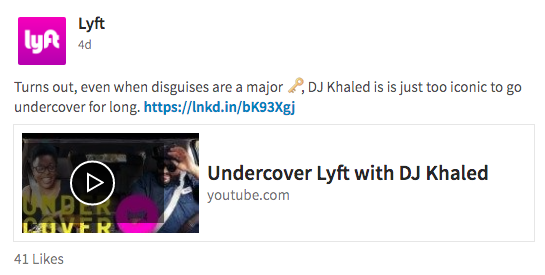 As a marketing professional, you have to communicate and control all LinkedIn connections. However, you have to do this in a more humanistic and personal way to get your posts viewed. With Sprout Social’s LinkedIn management tools, you can easily target your posts and reach the right audience with Post Targeting features. Whether you’re a group of three or or an enterprise team of 200, Sprout allows you to organize your LinkedIn content to match your overall company goals. LinkedIn is a unique space for social media management, but with the right tools and direction, you can transform your audience and community building strategies.